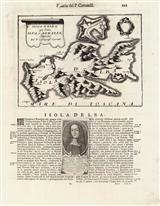 Description: Elba set above descriptive text with illustrations of the fortresses of Portoferraio and Porto Azzurro. Description: Porto Azzurro. 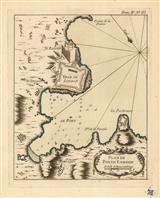 Plan of Porto Longon. Original colour. Description: Porto Ferrara. 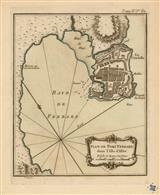 Chart showing the town and harbour of Ferrara on the Island of Elba. Original colour.